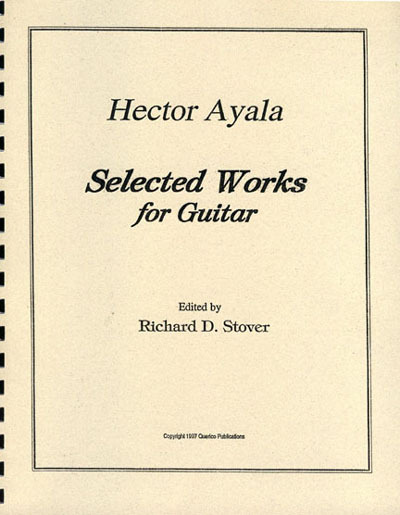 "available in digital download form"
The selected works of Hector Ayala is a marvellous collection of South American music ranging in difficulty from easy to virtuosic. Featuring a cross section from his published works, this is the first time Ayala’s music has been published outside Argentina in anthological format. It is hoped that this volume will prove useful not only to advanced players but also to students and teachers who wish to expand their knowledge and repertoire of Latin American Music for guitar. Titles are: 'El Regalon', 'Cholita', 'Querencia', 'El Coyuyo', 'Cancion', 'Milonga', 'Carinito', 'Canturreando', 'Nortena', 'Luna y Sol', 'Aire de Vidala', 'Romanza', 'El Sureno', 'Madrigal', 'Otono', 'Prelude No. 2', 'Zamba Arco Iris', 'Galopa No. 1', 'Bailecito', 'Prelude', 'Choro', 'Takirari', 'Guarania', 'Tonada', 'Vals Peruano', 'Gato y Malambo'.